Customary Law in the Modern World is the study of a coherent and well-established legal system, which is now operating in the context of a modern nation-state and therefore poised between remaining relevant and the threat of marginalization. 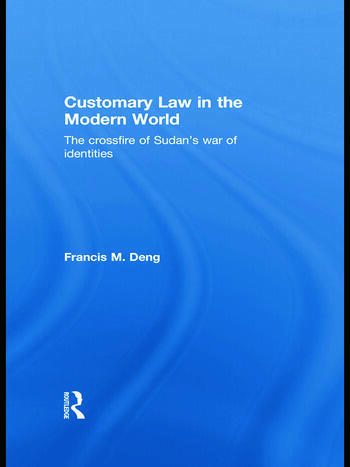 Focusing on Sudan, the author places customary law in its historical and cultural context, analyzing the fundamental and traditional values that underlie customary law and the impact of the war between the North and the South that lasted intermittently for half a century. He deals with the substance of customary law, covering a wide variety of areas: family law, property law, torts and criminal liability. Drawing on interviews conducted with judges, legislators and practicing lawyers on customary law and its future in the modern context, the book challenges the development of customary law to build on the positives of tradition and the reform of its shortcomings, particularly in the areas of human rights, gender equality and the protection of children. This book fills a gap in the literature on customary law, and will be of great interest to anyone interested in law, anthropology and politics. Francis M. Deng is the UN secretary-general’s special adviser on the prevention of genocide. He served as Sudan’s minister for state foreign affairs and Ambassador to the United States, Nordic countries and Canada. He holds a doctorate from Yale Law School and is the author or editor of more than thirty books.